New product design contest on Desall.com GEWISS and Desall invite you to design a new product for the home domotics system, proposing two new cover plates and two new switch buttons. 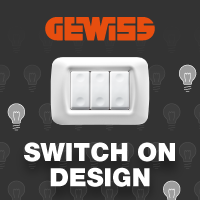 GEWISS relies on the international community of designers for the design of two cover plates and of two switch buttons, with a special attention to style and with a great aesthetic value. It is of the utmost importance that switch buttons and cover plates share an aesthetic and stylistic affinity, as the switch buttons might be used with both cover plates. You are invited to propose a new design for two domestic cover plates (i.e. not for industrial use), each hosting three button-modules (i.e. switches) and at the same time perform an important aesthetic function. Cover plate versions: the plates you suggest shall be available in two versions, characterised by two different styles and customer targets: a cover plate inspired by the Top system model and a new squared cover plate. You are invited to suggest a new cover plate inspired by the current Top system model (see Material files), maintaining the classical style and suggesting an always current design. Style: the cover plate shall be characterised by rounded shapes, with a classical design and a sober and functional style, able to enrich every environment and to adapt to various installation contexts. Customer typology: the target customer will be a public with a classical taste. The second version of cover plate you are invited to design shall represent a totally new product, that may aesthetically distinguish itself from the other cover plates available on the market. In order to create an innovative product, you are free to explore modern shapes and languages, in line with the most current aesthetic trends. Style: the cover plate shall have squared shapes, minimal lines, with a modern style, in compliance with the most current aesthetic trends. Customer typology: the target customer will be a public with a modern taste. Cover plates size: the cover plates shall have a minimum size of 117x80mm, able to host three switch buttons (for the size of the switch buttons, see the Switch buttons size paragraph). The minimum height shall be 7mm. In order to host the three button-modules for the switch buttons, each cover plate shall have a rectangular internal opening measuring 69,5x45,7mm (see Material files). Mounting modalities: the cover plates will be fixed on the support unit through snapfits. For an example, see the catalogue attached in the Material files. Where to use: the cover plates are meant for indoor use. Materials: the cover plates shall be realised in single-component thermoplastic technopolymers. Production technologies and costs: the cover plates will be realised through injection moulding and shall have a low production cost. Logo: the GEWISS logo shall be embossed on the cover plates directly through the moulding process, with a character size equal to about 3mm for the height and proportional length (see Material files). Surface finishing: the cover plates shall have a glossy finishing. Coherence between elements: in order to ensure an aesthetic continuity between the GEWISS products included in the catalogue and in particular between the cover plates and the switch buttons you design, you are invited to maintain a coherent style among the various elements and in line with the brand. You are also invited to suggest the design of two switch buttons, compatible for size and style with the cover plates you design and that keep into consideration also the possibility to be used with the current line of wall-mounting enclosures (see catalogue attached in the Material files). Button versions: you are invited to design two new buttons for domestic use (i.e. not industrial), with different style and customer target. 1) Button with circular recess: the first button you design shall be inspired by the current System command model (see Material files), characterised by the presence of two frontal circle recesses in correspondence of the pressure points of the switch button. Style: the first button you propose shall have a sober style, with elements that are in continuity with the current model, able to fit well with both cover plate versions you propose. You are invited to use a universal and timeless aesthetic code, to create an always current product. Shape: the characterising elements of your button shall be two new frontal circle recesses to include in correspondence of the pressure points of the switch button. Backlighting: the button shall be available also in a backlit version, accordingly it shall allow the light of the LED hosted in the switch to pass through (see Material files). In order to do so, you may reduce the thickness of the plastics or provide for the use of a translucent lens for the light guide. The backlighting shall be placed in correspondence of one of the two circle recesses, centred with respect to the horizontal axis of the button. 2) Button with decoration: the second button you design shall be characterised by a decorative element placed in correspondence of the pressure point of the switch button. This decorative element shall allow the user to intuitively identify the pressure point of the switch button. Style: the second button shall have a modern and elegant style, capable of fitting well with both versions of cover plate you suggest. Preferably, this button shall have a certain discontinuity from the current System model and shall accordingly distinguish itself from the other button you propose, interpreting the most current aesthetic codes into a unique product. Shape/decorative element: in correspondence of the pressure point you are invited to include a decorative element with shape and size at your discretion, capable of intuitively indicating where to press to operate the switch. In order to realise this element, you may suggest various workings to be realised directly on the mould. The backlighting shall be placed in correspondence of one of the two decorative elements, centred with respect to the horizontal axis of the button. How to use: the buttons you propose will have a tilting mechanism. Switch button size: in order to maintain compatibility with the other products included in the catalogue and with the cover plates you propose, the buttons shall have the following dimension, 23x45 with a height of 13mm, taking into consideration the distance between the wall and the farthest point of the button (see Material files). Where to use: unlike the cover plates, the buttons might be employed both for indoor use (flush-mounted) and outdoor use (when installed on wall-mounted water-tight enclosures). Materials: the buttons will be realised in polyamide based thermoplastic technopolymers (Nylon). Production technologies: the buttons shall be realised with injection moulding. Surface finishing: for the aim of the contest, you are invited to present your switch buttons with glossy finishing. Logo: the GEWISS logo shall NOT be present on the switch buttons. Coherence between elements: in order to ensure an aesthetic continuity between the GEWISS products included in the catalogue and in particular between the cover plates and the switch buttons you design, you are invited to maintain a coherent style among the various elements and in line with the brand, also considering the possible use of the buttons with the current line of wall-mounted enclosures (see catalogue attached in the Material files). -	With 6+6 modules/buttons (6 modules stacked on 6 modules). For more information, please refer to the Material files and to pag. 52 of the “Product Catalogue Domotics” attached. Deliverables: upload all the images that better present your projects (rendering, descriptions, CAD files, etc.) showing the various possible combinations between the cover plates and the buttons you design (both with and without backlighting), including other possible details and close-ups for the most characterising features. In order to better evaluate the projects, you are invited to include inside a .ZIP archive the 3D files (preferably in .stp format) and possible further slides or information. Participation is free of charge and open to designers and creative talents of any nationality aged 18 years or older. Participants can present one or more projects, but only the projects published on the www.desall.com web site, via the upload page related to “Switch On Design” will be accepted. The selection of the winner by GEWISS will be the result of an unquestionable evaluation and it will take into account originality, feasibility and consistency with the brief presented. Do you want to stay updated about "Switch On Design"?